Our newest Registration Consultant, Anne Warren, spent over 4 years in Australia, living in Sydney, Canberra and Melbourne. In her free time she travelled around in her campervan finding 'awesome' beaches or hidden rivers and generally living a very Aussie lifestyle. 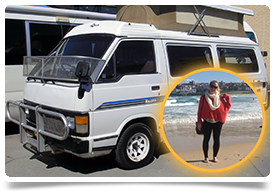 This is the second instalment of her Australian Adventures, detailing some of the fantastic experiences she would highly recommend! Canberra is not for everyone as it's pretty much in the bush! They couldn't decide between Sydney and Melbourne for a Capital so they created Canberra, which is supposedly half way between the two but actually much closer to Sydney (3 hours) than Melbourne (7 hours). Although it's the capital of Australia there's not perceived to be much to do there, however, it is a fantastic place to raise children. It's also very government orientated and most people who live in Canberra are public servants. The best thing about Canberra is that you feel like you are in Australia, not like in the big cities. You can go fishing on the rivers or four wheel driving up the Brindy Mountains and there are kangaroos jumping everywhere, which at the start is a real novelty but can make driving quite 'interesting' as they do have a bit of a tendency to jump out in front of cars! Although Canberra is inland every state in Australia has to have a port and Canberra got the best port… JERVIS BAY! Jervis Bay is a national park, voted to have the world's whitest sand - making you feel like you're on a remote Pacific Island. I would highly recommend a weekend to Jervis Bay - especially as it's only 3 hours from Sydney and 3 hours from Canberra! Look out for the next instalment of Anne's Australian Adventures when we're off to Melbourne in Victoria. For more information on relocating to Australia why not check out our blog or fabulous Doctors Guide which covers everything you could ever need to know about living and working in this fantastic country.